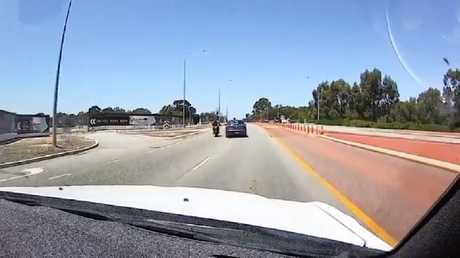 A Perth driver has been caught on camera swerving dangerously close to a motorbike, narrowly missing the rider before driving off. But what happens next is enough to leave him red-faced. 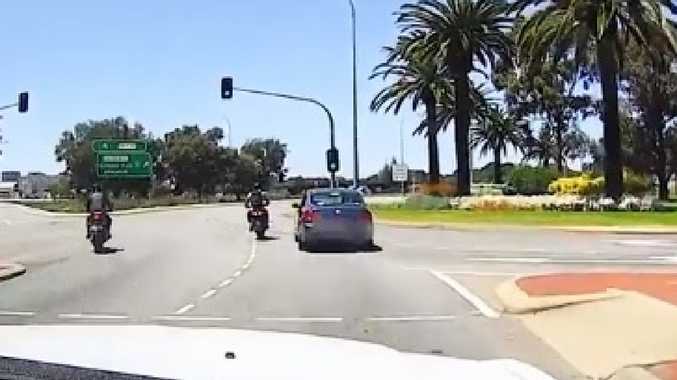 Dashcam footage caught by another motorist in East Perth around noon on Sunday shows two motorcyclists waiting at a set of lights next to a Nissan Skyline. 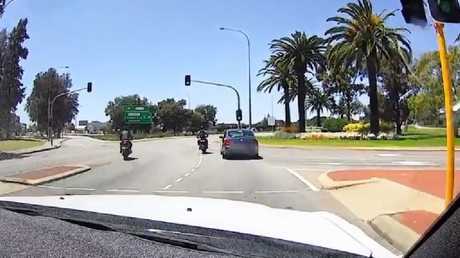 When the light turns green all three take off but shortly after that the sedan can then be seen swerving extremely close towards one of the bikers. "Got him. F***ing Jesus," the driver who captured the vision can be heard saying. It isn't clear exactly what sparked the incident along the Causeway. Police are investigating the road rage incident, which occurred on the Causeway in East Perth on Sunday afternoon. After taking off from a set of lights, a Nissan sedan can be seen swerving towards a motorbike rider before speeding off. The rider slows down in the left hand lane as the motorist speeds off. The footage then cuts to a set of lights on Shepperton Road where the man whose dashcam captured the incident tells the rider: "I've got (the driver) on camera. I'll send it to police for you." While waiting at the lights, the driver of the car in question can be seen getting out of his Nissan to confront the motorcyclist, but hastily returns to his car when he realises he's forgotten to put his handbrake on. 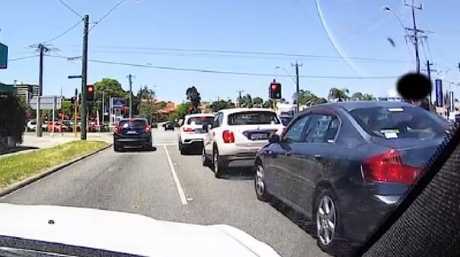 The driver of the Nissan (right) gets out of the car to confront the motorcyclist, but runs back inside his car to stop it from hitting the car in front after realising he didn’t put the handbrake on. It scrambles back inside the car to stop it from colliding into the rear of the white car in front. Perth Now reported that police have since been made aware of the incident but no charges have yet been laid.